Clean up after the holidays are a snap with the Deluxe Heavy Duty Christmas Tree Bag from the Elf Stor. If your tree is something you want to keep for years to come you want a bag that will keep it safe and good as new year after year. The Elf Stor Deluxe Christmas Tree Bag is what you are looking for. Made of heavy-duty canvas, quality zippers and straps with buckles, this bag will last as long, if not longer than your tree. Within minutes you can go from a fully standing tree to a neatly stored away treasure with very little effort. Specifications: Fits trees up to 7.5 feet tall unassembled. Includes (4) 7.5 foot adjustable 1" straps to bind the tree segments. Made of high impact tear-proof canvas. 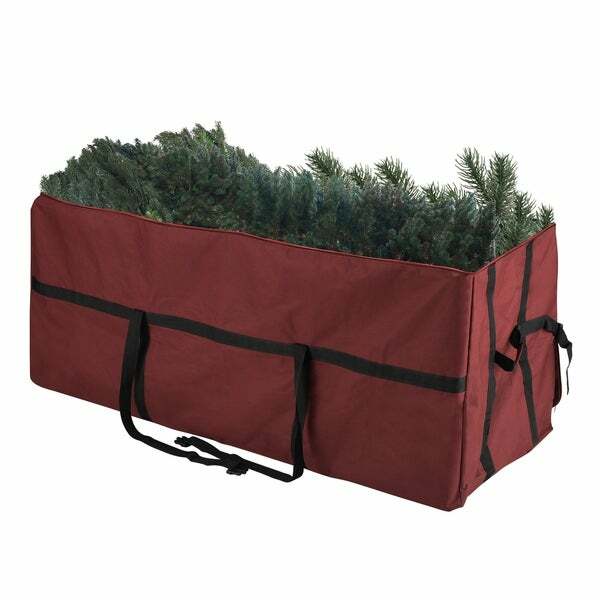 Sturdy Carry Handles for easy transporting of your tree. Moisture resistant, keeps out dust and pests. Folds flat when not in use. Measures 48" L x 24" H x 24" W. .
Dimensions 12.0 In. X 8.0 In. X 2.0 In. Perfect!! We loved how easy and heavy duty this Christmas tree storage bag is. This was the first year we decided to purchase a artificial tree. We were concerned about how we would store it, after purchasing this storage bag we are very happy we purchased the artificial tree and storage bag. This tree storage bag is beautifully made. Very sturdy and fits a very full tree. I bought 2; one green and one red. I used one for a large full tree and the second one for 10 garland strands with lights and some decor on them. I am so glad that I found these. I would highly recommend this tree storage bag for anyone who is in the market to buy one. Truly a great find. This is so much bigger in real life than I thought! Better quality than I was expecting too! Not only does it fit my new 7.5' tree but also the old 7' tree that I decided to keep! I love the straps on the side that you can sinch down to its not as big and bulky. Love it! Big enough to keep tree. Opening big enough to easily arrange pieces of tree in bag. The bag seems sturdy enough to last for years, I hope that this proves to be true! Holds our tree, garlands, and tree stand! Fits under the bed too! Let's face it, its a big nylon bag. It works for what we need it for. Great item for a great price. This works well with our tree and it heavy duty so I know it will last for years to come and the price was great. The box the tree came in was way too small to repack the tree in for storage. This storage bag has the height and width to handle our tree and the carrying strap will make bringing it back downstairs next Christmas much easier.